On the way towards faith: The Road to Grantchester – Joyce's mystery and fiction book reviews with some non-fiction too! As soon as I saw this title on NetGalley, I desperately wanted to read it. Many thanks to Bloomsbury and NetGalley for granting my request. The opinions below are my own. I read the first Sidney Chambers novel, Sidney Chambers and the Shadow of Death, when it was first published. I was captivated by the character of Sidney and wanted to know more about him. I have continued to read the stories and have adored the Grantchester series on TV. For me, James Norton has personified Sidney in a most satisfactory way. 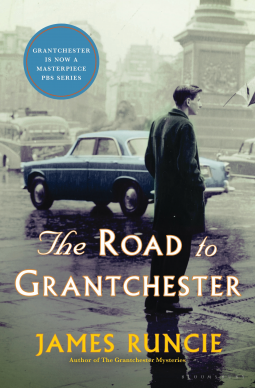 The Road to Grantchester tells the story of Sidney before he was the TV character or the man in SC and the Shadow of Death. I was so pleased at the prospect of learning how he became himself. The beginning of the book was not easy. After a brief prelude, Sidney is immersed in the horrors (and I mean horrors) of WWII in Italy where he serves with Robert Kendall. Robert is the brother of Amanda, a key character in the series. What Sidney and his fellow soldiers witness and participate in is truly unspeakable. James Runcie has written about war in a way that will make the reader long for peace. Survival in his circumstances is kind of a miracle for Sidney. However, not everyone important to him makes it home safely. As a reader, because of how awful it was, I was relieved to move to the part of the novel that was post war. Sidney comes home to a world that has changed and yet he has changed even more. He tries to understand what he is meant to do with the gift of his life. After much reflection, he decides to join the church. The reader follows Sidney on his on-going faith journey. This book is about those important to Sidney. There is Robert his best friend and war compatriot…no spoilers here so I will not say more. As in the TV series, there is prickly Amanda whose relationship with Chambers (as she calls him) is complex but important. I left this book wanting to reread all of James Runcie’s books. This is an excellent read if you are a fan of Sidney, want to remember why war is a mess or if you want to understand a protagonist’s wish to live a meaningful life. This novel may not be for everyone but for me it was a five star read. I loved the Grantchester tv series! I had no idea it was based on a book. I’ll have to check out this series. I really enjoyed reading your review. Thank you! The books and tv show diverge on some things. I think that the tv show will be back this summer. Really? I didn’t know that. I’m excited! Yes but…do you want a spoiler? Maybe…it is a mystery series. If it’s the main story, I don’t mind spoilers, but I don’t want specific murder mystery spoilers.